Simple soup lunch and discussion. As I walk’d through the wilderness of this world, I lighted on a certain place, where was a Denn; And I laid me down in that place to sleep: And as I slept I dreamed a Dream. John Bunyan wrote what is considered to be the first enduring English novel in inauspicious circumstances: behind bars, in extremis. A “Denn” is a prison, and Bunyan was a Puritan dissenter. He wrote most of the book in Bedford county gaol, having been arrested for his beliefs during the “Great Persecution” of 1660-1690. 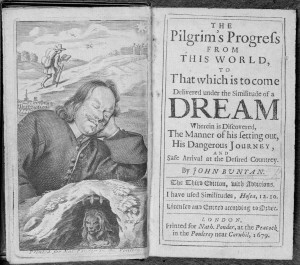 Like so many novels that followed John Bunyan’s work, The Pilgrim’s Progress blends fact and fiction. As well as being the record of his dream, a well-known fictional device, it is also a classic quest story, of a journey fraught with danger. The greatest value in reading allegories and parables is to engage both our intellect and our imagination, and to learn at least as much about ourselves and our own spiritual journeys as we do about that of the author. The discussion of “The Pilgrim’s Progress” will be relatively informal, although the goal will be to cover as much of the book as possible during the 4 or 5 sessions, which means reading about 50 pages each week. The Wednesday and Thursday sessions will be in parallel, providing options to suit people’s availability.